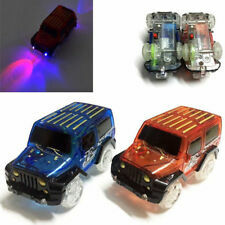 2 x 5 led Cars Kids Fun Flexible Variable Car Track Set Battery Operated Replacement UK SELLER FAST DISPATCH Description 2 pc Replacement Car For Track Set ---2 CARS ONE OF EACH COLOUR RED AND BLUE ---REQUIRED 1AA BATTERIES IN CAR ( NOT INCLUDED ). Length 914mm. Detailed scale model designed for adult collectors and is not intended for play. This product is not suitable for children under 36 months as it may have sharp edges and small parts. Any problems?. Peco SL100 1 yard Wooden Sleeper Flexible Track in excellent used condition with little use some drill holes in some sleepers Please study photos and ask questions before bidding all items are sold as seen. ≡ Show Menu MAGIC TRACK Racetrack 165pcs Glow in the Dark Track LED LIGHT UP RACE CAR Description MAGIC TRACK Racetrack 165pcs Glow in the Dark Track LED LIGHT UP RACE CAR ---Flexible car set very easy to assemble can be twisted ,turned and flexed into different track shapes and layout ---Realistic scene with music and lighting giving you experience of ultimate joy ---This glow in the dark track set bends, flex and glows ---Lights up car ---5 LED lights in the car ---Excellent fun at night, when the whole track set glows in the dark. ---Easy to set up ---Easy storage Package Includes: ---1x Car Magic Tracks set in Box supremeauctiononlinesoftware.redesigner. Length 970mm. Close the gap in the sleepers by sliding the two ends together. Easy Assemble Suitable for Indoor Play, Batteries Required (Not Included). Peco Code 100 Flexible Track wooden sleepers X 12 in Fair Used Condition has been lifted the from my layout some sleepers are broken and glue marks present please study photos and ask questions before bidding all items are sold as seen and would bennifit from a clean with track rubber. HORNBY R621 Fully Flexible Track Pieces 970mm - PAY POSTAGE ONLY ONCE! Length 970mm. Detailed scale model designed for adult collectors and is not intended for play. This product is not suitable for children under 36 months as it may have sharp edges and small parts. Any problems?. 5 out of 5 stars - HORNBY R621 Fully Flexible Track Pieces 970mm - PAY POSTAGE ONLY ONCE! 10 product ratings10 product ratings - HORNBY R621 Fully Flexible Track Pieces 970mm - PAY POSTAGE ONLY ONCE! CHILDRENS COLOURFUL CAR TRAX FLEXIBLE TOY RACE TRACK PLAY SET BOY XMAS GIFT Description: ---CHILDREN TOY PLAY SET ---EASY TO ASSEMBLE ---FLEXIBLE TRACKS ---INCLUDES VEHICLE (1 x AA BATTERY REQUIRED) ---BATTERY NOT INCLUDED ---FOR AGES 3 . THIS SALE IS FOR LIMA N-12 NICKEL SILVER PROFILE GOLDEN SERIES. IN ORIGINAL BOX.